The first thing the good people of Walsall have to face up to as they survey the remarkable new museum that has appeared, as if by magic, in their town centre, is the fact that they have done nothing to deserve this building, or the collection it houses. Absolutely nothing. I would have tried to put this more charmingly but let us be blunt and Black Country about it. The gallery has been handed to them on a plate. The awkward implications of this situation are something we must ponder once we have toured the new museum, and admired it. Rather unusually for an internationally acclaimed art gallery, this one is opposite a Woolworth’s, next door to a British Home Stores, and getting to it could hardly be easier. The station is part of the shopping centre, and the shopping centre acts as the gallery’s forecourt. You go past Superdrug and Quasar, past ye olde pub, and turn left. A fast walker could get from the platform to the Picasso in three minutes. The new art gallery in Walsall also has an eloquently direct name. 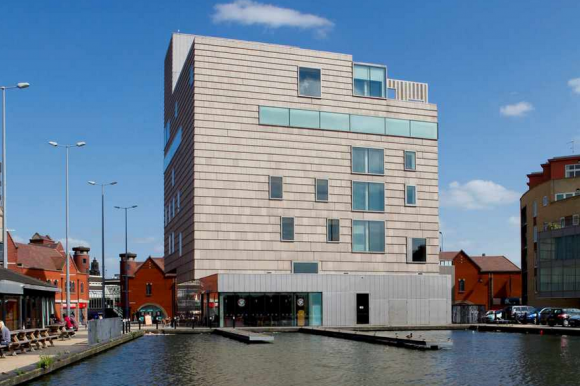 It is called The New Art Gallery Walsall: sleek minimalism is its chosen style. I would like to praise its elegantly sparse architectural textures for you in some detail but the architecture critics have beaten me to it. Rarely has a new British building been received with such rapture. 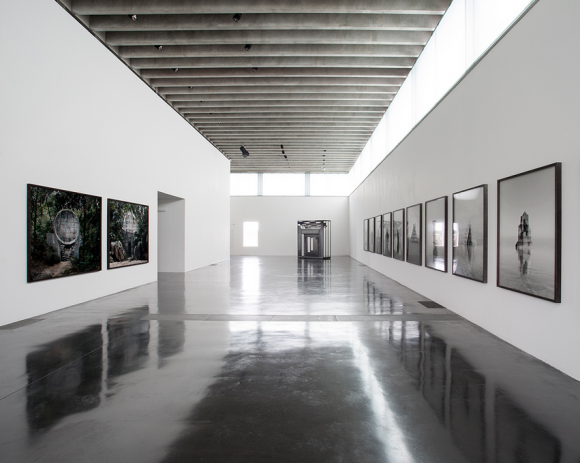 “World class gallery”, trilled the Guardian. “Stunningly beautiful” climaxed the Telegraph. Walsall – and who could have predicted this? – has forced itself onto the international art map. However, for the purposes of this intermittently grouchy article, it is relevant to notice immediately that the new gallery bears no resemblance to anything around it: not to Woolworth’s, not to the British Home Stores, and certainly not to the folksy canal barge moored outside, covered with hand-painted pub-signs, and leaking thick Black Country nostalgia from every tarred join of its creaking timbers. The intrinsic difference between the New Art Gallery Walsall, and Walsall itself, is what is so fascinating about this set-up. The only reason Walsall has its new museum is because, in 1901, a certain Kathleen Garman was born in Wednesbury, and Wednesbury is not far from Walsall. Kathleen was a wide-eyed beauty with a feline look to her, and this was the kind of beauty that attracted the odious and immoral Jacob Epstein. Before the First World War, Epstein had been the most exciting sculptor in Britain. Modernism suited him: rectangles and hard outlines kept the huge natural reserves of gooey melodrama that splashed around inside Epstein penned up. By the time he seduced Kathleen, in 1921, the unsightly melodrama had broken its modernist banks, and was pouring out like lava. One of the many excellent spectacles the new Walsall art gallery offers is the sight of Epstein turning from a thrilling futurist sculptor – whose Rock Drill, half-man half-machine, is probably the most powerful evocation of fear of a mechanised future in British art – into a ridiculously sentimental moulder of Christ’s sickly hands, showing off their wounds. In works from Kathleen Garman’s collection, you see near-genius becoming obvious kitsch; a dramatic modernist turning into a melodramatic has-been. Epstein may have ended up as a third rate sculptor but he remained a world class lecher. When Kathleen met him he was, of course, already married. Women wandered in and out of his life in a constant trickle. Kathleen had three children by him, before, eventually, in 1955, he married her. Two of the children died young. A thin and fragile daughter, Esther, killed herself; the son, Theo, a painter, tried to do the same before succumbing to a heart-attack in curious circumstances. The third, Kitty, drew two short straws. Not only was she Epstein’s daughter, but she also became the first wife of Lucian Freud. This tragic criss-crossing of personal lives is made unusually tangible in the opening display of the new museum. It is filled with portrait busts, by Epstein, of the various women in his life: Kathleen, Esther, Kitty. It has about it the air of a sad harem. The missing male presence seems as noticeable as the feminine melancholy. Van Gogh’s famous portrait of his prostitute lover, Sien, naked, head-bowed, which Kathleen also collected, hangs on the far wall. ‘How can there be on earth a woman alone, abandoned?’, asks the famously sentimental Vincent in a caption for his drawing which fits Epstein’s portraits of his women pretty well. Epstein died in 1959. Kathleen – Lady Epstein by now – began collecting soon after, with her new partner, Sally Ryan, an American lesbian who had been a pupil of Epstein’s. Epstein’s bust of Ryan is also included. She had cropped hair, and a fierce gaze. The nature of Sally’s relationship with Kathleen is left uncommented upon: we can only speculate. What is certain is that the two of them collected passionately – Van Gogh, Manet, Picasso, Monet – and that after Kathleen’s death the collection was left to Walsall. Until now it has been housed in the vaults of the town’s library. But because you and I cannot resist losing on the lottery any more than Epstein could resist hurting the women in his life Walsall now has a specially commissioned new museum with which to show off these inherited goodies. Crowded into a suite of wood-lined galleries, the Garman Ryan collection has some fine things in it – embedded in dross. The mixture has been hung thematically according to its original owner’s demands, with a room for landscape, flower paintings, portraits of children etc. In human terms, all this is warm and endearing. In art critical terms it forms a depressing stew. The architects – the newly famous Adam Caruso and Peter St John – have chosen a suitably domestic scale for their wood-lined display. I found the results claustrophobic: like intruding upon the private quarters of dysfunctional neighbours. Much more impressive, and a welcome relief, are the upstairs exhibition galleries which open out onto clever views of Walsall, and which are lofty and cleanly lit. These are, already, some of the finest art spaces in Britain. They have in them, for the moment, a pleasant selection of new art devoted to the theme: Blue. There’s a blue Andy Warhol. Some blue Damien Hirst dots. And the Tate in London has generously lent that magnificent Blue Period portrait of Picasso’s first French love, Madeleine, in a see-through chemise. These top floor spaces are so excellent that I fear terribly for their future. What is so praise-worthy here, what has caused the rapture, is the sheer international élan of the whole building. It happens to be in Walsall. It could just as easily be in Warsaw. In the difference between it and its surroundings, between this sleek imported minimalism and the endemic textures of the West Midlands, I sense trouble. An international-class building needs an international-class exhibition programme to fill it. That is going to take commitment and money. Will the good people of Walsall be as generous in the future as Kathleen Garman and we lottery losers have been in the past? I hope so. But doubt it.